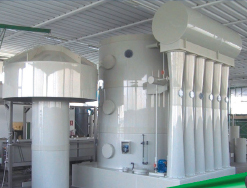 Field treatment civil and industrial waters: tower of stripping and scrubber of chemical cleaning. Field city refusals: battery lucks scrubber cleaning emissions. Field industrial refusals: depurator powders and dissolvent from reception premises/drainage, warehouse and working industrial refusals. 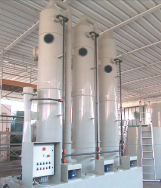 Treatment black waters: bio-filters cleaning smells; double lucks scrubber in series for cleaning smell and polluting chemical from system depuration black waters. Field energy - power: smoke cleaning from incinerator of refusals for the simultaneous production of thermal energy and electrical worker. 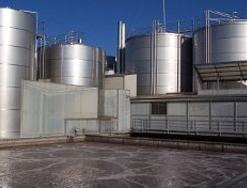 Biogas: desulphuration system of biogas with biological and chemical treatment for the energy co-generation. Composting: air flushing for composting system and double scrubber for aspiration and cleaning of smells and polluting. Drying biological mud: scrubber cleaning of polluting air from dryer CDR. Aspiration and cleaning of smell and chemical polluting from systems of biological treatment of industrial sewage (nitrification – de nitrification) and treatment of muds from flotation devices.